Happy birthday Merv Griffin! Merv was born on July 6th, 1925. In celebration, we thought we would post five fun facts about his life and accomplishments that you may not have heard about. Merv had a passion for singing and got his start as a singer on the radio at the young age of 19. His 1950 hit song “I’ve Got a Lovely Bunch of Coconuts” sold 3 million copies! 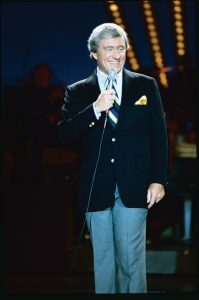 The Merv Griffin Show was on for 21 years and showcased many of the biggest stars and luminaries in entertainment, art, music, and politics. Over the years the show received 11 Emmy Awards. Merv wrote the famous “Think Music” for his gameshow Jeopardy in just 90 seconds! Hear Merv’s son Tony Griffin share the story about the creation of this famous song in this fun short video we’ve posted below. Thanks for stopping by our blog to help us celebrate this special day!